DAYTONA BEACH, Florida – January 26, 2015 – Nissan GT Academy standouts Nick McMillen and Bryan Heitkotter were thrilled when they got the call to drive Doran Racing’s #41 Nissan 370Z in the Continental Tire SportsCar Challenge season opener Friday at Daytona International Speedway. They were even more thrilled when their entry finished a solid sixth in the 68-lap, 2.5-hour race that supported this weekend’s Rolex 24. 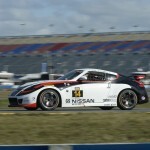 Doran Racing’s #14 Nissan 370Z driven by Brad Jaeger and B.J. Zacharias appeared poised for at least a top-five finish and perhaps a podium. It ended up 15th in the Grand Sport class, however, after a plastic hinge supporting the gas pedal let go with about 35 minutes remaining in the race as Zacharias was in seventh place and entering Turn 1 of the 3.56-mile road course. He pitted, the crew replaced the part and he did a few more laps, but the goal at that point became just to salvage as many points as possible. McMillen, of Salem, Ore., started the #41 ninth in the 53-car field. Jaeger, of Charlottesville, Va., originally qualified 11th but he was right beside McMillen in tenth place after the BMW that originally qualified tenth crashed in the morning warm-up and wasn’t able to start. McMillen dropped back to 13th initially, but he was 12th by lap two and he stayed in that spot until he moved back into the top 10 due to pit stops around the first full-course caution on lap 11. He was scored mostly in 12th or 13th place for the rest of his stint, but he got as high as third due to pit stops before he pitted for Heitkotter to take over during a green-flag pit stop around lap 28 with 1:23 remaining in the race. Jaeger advanced to eighth by lap two and remained in that spot until he vaulted to sixth after the first of three full-course cautions. All of the cautions were for single-car incidents for cars off course and needing a tow. Jaeger had a stirring battle with Max Riddle’s Aston Martin following the restart, and he was comfortably in seventh when the second full-course caution waved on lap 18. Cameron Lawrence passed him on lap 23 to push him back to eighth, and he was still in that position when Zacharias took over around lap 25 around the one-hour mark. Both starting drivers posted their best laps early. Jaeger’s was on lap four with a 1:57.722, and McMillen’s was lap seven with a 1:58.829. Zacharias’ fastest lap was lap 31, when the Cincinnati-based driver turned a 1:57.425 despite dealing with a stomach ailment. Heitkotter, of Fresno, Calif., set the fastest lap of his stint on lap 35 with a 1:58.117. At the halfway point in the race on lap 34 Zacharias was 11th and Heitkotter was 12th, 1.590 seconds behind him. With one hour remaining they were in the same order but they were up to eighth and ninth. At that point another Nissan driven by Brett Sandberg brought out the third and final caution on lap 42 when it stopped and needed a tow. Zacharias was up to fifth and Heitkotter moved into sixth when pit stops occurred under that yellow. They both fell back when they pitted too, but on lap 47 with about 38 minutes remaining Zacharias was in seventh place, just 0.091 of a second behind the sixth-place car of Trent Hindman, and Heitkotter was ninth, looking for a way around Jade Buford. Shortly thereafter the hinge let go on the #14’s gas pedal. Heitkotter’s #41 was still rolling in eighth place, although he was still dealing with Buford. He got around Buford with 24 minutes remaining to advance to seventh, and 2 minutes later he passed Kris Wilson’s Aston Martin to take sixth. He was about 2.7 seconds behind the fifth-place car when the checkered dropped for the race, which was officially called the BMW Performance 200. The series’ next race is slated for Friday, March 20 at Sebring International Raceway in Sebring, Fla.
For more information on Doran Racing, see DoranRacing.com and its Facebook page. For more information on the series, see IMSA.com. Nick McMillen — “It was fun, and definitely exciting! “I never got to start a race before; last year in the Blancpain Endurance Series, I either drove the middle or the last stints. It was also the first time I got to really battle for position, and to deal with the slower ST cars. “Every lap here was a learning experience. Each lap I gained more and more knowledge. It was really fun. “There was one Mustang that took me awhile to get by. Car placement and knowing who to trust and who not to trust were all part of the learning experience. “I’ve never experienced a track with high banking before either. I didn’t realize how steep the banks really were. It was a whole different experience. That part was odd, but fun. Bryan Heitkotter — “It was fun. Nick put in a good stint and kept the car in perfect shape. There was a lot of green-flag racing and we were able to get sixth, so it’s great to start the year off strong. “There was a lot of real close racing during my stint. It took a lot of time for me to get around the 158. He’s clean but effective. “I’m really happy to be back with Doran Racing. They did an excellent job in preparing the cars. This was my second race at Daytona; I was in the ST class last year. 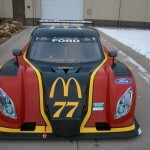 Brad Jaeger: “My stint went to plan except for when I came into the pits. “The goal for my whole stint was to stick with the leaders. I think I could have pushed harder and run higher up, but the car was running a little hot during my stint so I just wanted to keep the temperatures within the normal range, save the engine, keep the car clean and save it for B.J. “The throttle pedal started shifting its position during my stint. It was amazing that B.J. could stick with it as long as he did. B.J. felt we had the pace to move up and we were definitely in line for a top-five finish and maybe even a podium, but that’s racing. “The pedal was just starting to shift during my stint. During the driver change we might have hit it. B.J. Zacharias: “I guess I got a stomach virus or something. I started to get sick last night. “The internal hinge on the gas pedal broke. It’s about a half-inch by one-eighth-inch thick piece of plastic, and it just snapped off. “When I got in the car it was already broken or breaking. For all the left-handers I was only getting half throttle. “Over the radio, Kevin [Doran] said to push on the very base of the throttle. It’s sort of amazing it lasted as long as it did, but it finally snapped off completely when I was going into Turn 1. We came in and replaced it and got back out, but by that time we were already several laps down. We salvaged 15th place out of it, so we got a few more points than we got here last year. “The adrenalin you get during your stint when you’re running for position helped keep me from thinking about my stomach, but those last 20 minutes or so were hard.